The New Tool Preset dialog box lets you create a new tool preset. You will need to select a tool, adjust the properties, and then create a tool preset for it. Once you have created a tool preset, you can make adjustments to fine-tune it, as well as create a keyboard shortcut for it. All tool presets are displayed in the Tool Presets toolbar. Lets you set a keyboard shortcut to quickly access your preset. By default, the shortcuts are unassigned. To assign a keyboard shortcut, select Edit > Preferences > Shortcuts > Tool Presets (Windows) or Storyboard Pro > Preferences > Shortcuts > Tool Presets (macOS). 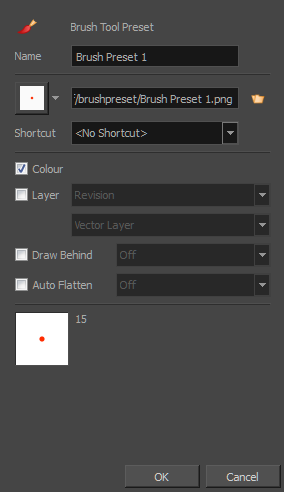 When this option is selected, saves the specified Draw Behind option to the tool preset. When deselected, the current Draw Behind status is unchanged when the tool preset is clicked—see About the Brush Tool Modes. When this option is selected, saves the specified Auto-Flatten state to the tool preset. When deselected, the current Auto-Flatten state is unchanged when the tool preset is clicked—see About the Brush Tool Modes.